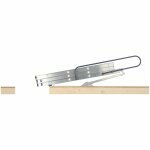 3 sections loft ladder with spring assisted 'Easy Stow' system gives total control when lowering or stowing the loft ladder. Compact sections to take up less space when stored in loft. The Werner 3 section Easy Stow Aluminium Loft Ladder is a perfect loft-access solution, extending from three overlapping sections that can be affixed to the inside of the loft to be lowered down when access is needed. 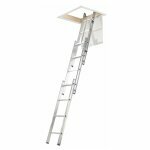 The ladder features a spring assisted system to provide total control when lowering or stowing the loft ladder and also comes with an in-loft handrail for added safety and comfort when entering or leaving the loft. 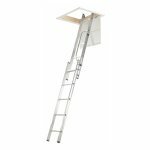 Measuring (H)139×(W)30.5cm, this ladder has all the components needed for DIY installation, including a universal stowing pole and comprehensive instructions. 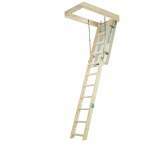 It also has D-shaped rungs for added comfort and security. Suitable for heights up to 3m.